NOTABLE BAG: Mostly sport tickets. BEST BROWN: 1lb wild brownie for Jim Pickford. BEST BLUE: Several weighing 3lb 8oz. BANK ROD AV: 2.06 fish per angler. BOAT ROD AV: 3.68 fish per angler. Sport: A nice spring day feeling warm for the most part. There were some good catches made with the boats around willow island having the best sport. Fishing the bank and landing 6 fish was Ken Whiteside. Ken fished a black and green udf fly on a floating line with Bens beach being his best spot. Both landing 5 trout from the bank today were Keith Landless and Dave Banks. Both anglers found buzzers fished in Hollins bay effective. Fishing from a boat were Jim Pickford and Ray Sanders who caught 14 fish between them. They caught the majority of their fish in the willows and along the northern shallows with olive being the predominant colour in their flies. Landing 17 fish from willow island was David Manning. David fished a washing line set up on an intermediate line catching on buzzers in the morning then on an olive booby this afternoon. There were several osprey sightings today on the lake and i saw a swallow no too far away, the earliest i have seen one, hopefully this is a good sign. Syotw. This entry was posted in Stocks Reservoir Fishing Reports on March 31, 2016 by staff. Sport: Just a quick report tonight. The weather kept most of the anglers away over the last two days so it has been quiet at the fishery. Luca Sutton (aged 12) and I took a boat out yesterday afternoon for a few hours. We tried a few areas but the most productive area was around Willow Island and the Northern Shallows. We had four to boat including a double figure rainbow, we had the chance of a few more and dropped one at the net. We caught on both a fast glass and a Di5 line on black blobs and doubles. The best retrieve was a steady / slow draw. Today Tony Taylor had a very productive session whilst fishing along Hartley’s Bank, around Bell Point and on Ben’s Beach. He used his sinking line and two booby method to catch twelve trout (that’s 23 in his two visits this week). His best pattern was a yellow eyed straggle fritz cats booby. He figures of eights slowly whilst the line sinks down then mixes his retrieve along the bottom between short strips and a figure of eight. This entry was posted in Stocks Reservoir Fishing Reports on March 30, 2016 by staff. Sport: The weather wasn’t too bad this morning but it got wet and cold this afternoon. The best catch today went to bank angler Tony Taylor with an 11 fish haul. Tony found fish on Bens beach and Hartleys bank with boobys on a sinking line being his best tactic. The boats caught a few fish around willow island and the northern shallows but the relative shelter of Hollins bay was the best spot for boat anglers with both boobys and lures on sinking lines being best. Syotw. Paul. This entry was posted in Stocks Reservoir Fishing Reports on March 28, 2016 by staff. The 2016 GREYS PAIRS CAMPIONS: Fred Bainbridge and Andrew Scott. Good angling fellers. Ian Greenwood and Brian Thomas were third. Ian also won the Nigel Haigh Trophy for Top Individual on the day. Ben Dobson and Gary Martin were fourth over all. This entry was posted in Stocks Reservoir Fishing Reports on March 27, 2016 by staff. BANK ROD AV: 2 fish per man? Sport: It’s hard to tell how the bank fished today as only three fished it and two left whilst I was at the boats. I can tell you that Gary Martin caught two on a half day ticket and his bag included a nice 3lb blue. From the3 boats we had some good scores on a variety of lines from sink tips to fast sinkers. 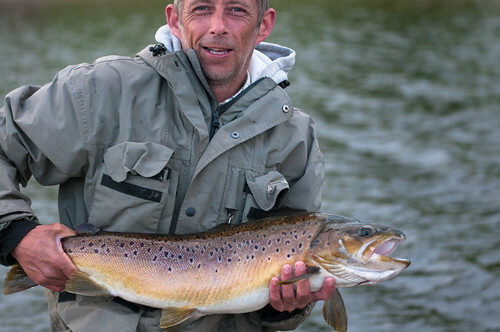 Andy Cooper and Rick Nuttall had twenty two trout to their boat including the nice 13lb rainbow pictured below. They caught on a variety of lures on sink tip lines. Earlier this week Graham Child caught this stunning double figure rainbow on a size 14 black buzzer whilst bank fishing in Nerwclose Bay. This entry was posted in Stocks Reservoir Fishing Reports on March 26, 2016 by staff.